Once upon a time, the love that dared not speak its name inspired many books that “spoke” of that love either openly and proudly or, more often than not, illicitly and tittilatingly. 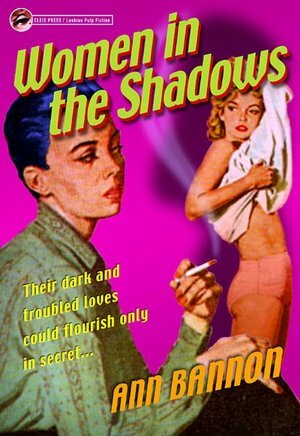 Ann Bannon, wrote of lesbian intrigue in a series of pulp fiction novels that would later be collectively staged (under the guidance of Lily Tomlin and Jane Wagner) as The Beebo Brinker Chronicles. Ann wrote boldly, ground-breakingly, despite her own traditional marriage and because of her own passionate, if unorthodox, yearnings. At home, with family and friends, Ann Weldy was the author who dared not speak her pen name. Today, Ann Bannon visits The High Bar to raise a toast to and raise the bar for… lesbian pulp fiction. And, in turn, we raise a toast to Ann Bannon for all she has done for countless women (and men) over the past half century who took solace in her prosaic explorations of love and lust in such a manner to give them the confidence to speak of their own. For a little bit more of my conversation with Ann — shot after the director Jason Ganwich called Cut! — try this episode’s Chaser, courtesy of The High Bar. This is a wonderful and informative piece thanks for runnning it, and Ann Bannon is a national treasure! I concur, Gary. Ann is a significant American writer who deserves much more credit for her accomplishments, both in terms of literature and community empowerment. Thanks for watching AND enjoying the episode. I love Ann, in fact I dedicated my first book called Queer Culture to her. She gave me the focus i need in editing my photography and is a very important artist, and person in my life and in the lives and rights of all Queer people. Thanks for watching, AJ, and thanks for your kind words. I know Ann has touched so many lives and it is heart-warming to start hearing from some of these folks, including yourself. I never cease to be amazed by how much artists can do to enrich others, and not just because of the beauty of their work. Taking a quick peek at your website, AJ, I imagine you are doing the same for Queer people and straight people. Thank you for sharing your gift. Warren, what a fantastic interview with Ann. Although I’ve talked at length with her, you managed to pull out a few little details that I hadn’t heard before. Ann has been a beacon for many – so much so that I put her in my Hall of Fame (http://www.lorillake.com/annbannon.htm). She’s been a great deal of support for the Golden Crown Literary Society and in fact the GCLS has an award named after her. She’s the epitome of grace and charm, and you did a lovely job interviewing her. Thank you so much for including her at The High Bar! Thanks so much for watching this episode, Lori, and for your very kind words about the show. Honestly, Ann is a hero to anyone, gay or straight, wishing to express themselves, out themselves in bold, literary fashion. I reviewed your Hall of Fame and I admire your choices. Surely, there are more to come. Keep doing what you’re doing, Lori, and thanks again for your graciousness. Thank you so much for this interview, Warren. Ann is truly one of the most important writers of her generation (and ours). My wife and I met her San Francisco at the premiere of The Beebo Brinker Chronicles after stalking her for several years and naming our punk band after one of her characters. We arrived at the end of a west coast tour and Ann saved me from LA food poisoning with her wit and ibuprofen, so that we could play in the lobby of the theatre at the party after the show. She gave a wonderful interview before the Beebo show also. It is always a pleasure to listen to her account of this incredibly important part of our literary and political history. Cheers! Thanks so much for watching, James. We agree: Ann is a treasure for multiple generations to read and celebrate. While she barely needs the assist, I hope our conversation at The High Bar will inspire uninitiated to pick up her books and enjoy some wonderful, provocative, ground-breaking novels that also happen to be just plain fun. Might I ask how you learned of this episode, James?